Unlike any other download manager, it is actually hard to classify DAP 10 under any category of software. Fact is while its core remains truly with downloads, it is a versatile platform that enables the user to do a multitude of things. For instance, it can access FTP servers, browse the net, check and procure mirror sites, convert video to mp3, preview during downloads and much more. DAP recognizes the widest range of websites for video streaming and downloading. In fact, with an integrated browser you can stream live HD videos or download and convert them in one go. 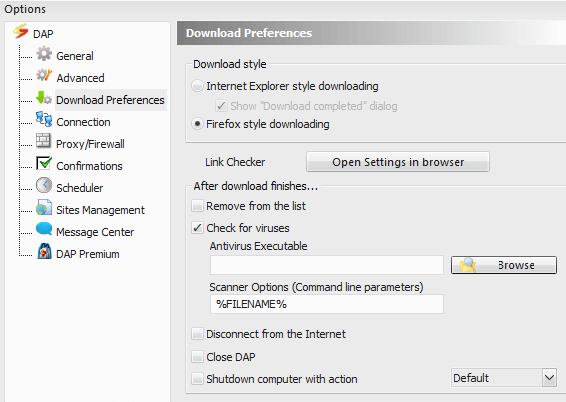 Other than setting download speeds, mirror site choice and such DAP also provides users with various download options. For instance you can choose to run a virus scan on any download you are performing (it uses your pre-installed antivirus of choice). It even allows pre-emptive link checking before downloading anything at all. Why waste your time and money downloading a potentially dangerous or empty file when with DAP you can check the link and files beforehand? You even get the opportunity to directly rip mp3 from online videos or YouTube. Like the song you are listening to but don’t want the video? Let Download Accelerator Plus rip the music right out of the video on your behalf. And if you have a video but want to extract a portion of the music then run it through the video to mp3 converter integrated into the DAP interface. 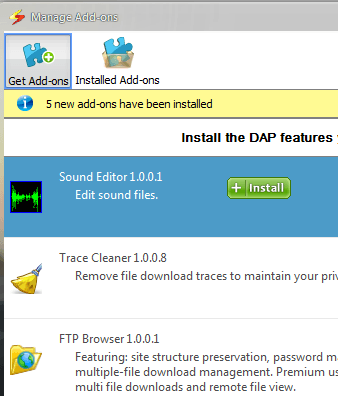 Some of the other free features of Download Accelerator Plus include FTP downloads from a website to extract all files and folders on the site, DAPsters Manager that monitors many sites for possible downloads and helps you search for your files better, a download history to let you know what you have downloaded and when. Best of all, the interface is rather sleek and intuitive with hardly any problem areas. Getting used to it is a matter of practice and with limited buttons, you really won’t have to refer to the instructions more than once. 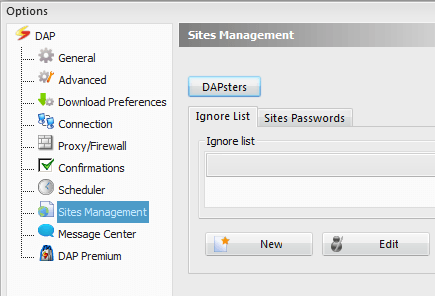 Finally, for developers DAP 10 provides the ability to improve its usability through add-on enhancements. Not many download managers come with this capability of truly customizing the interface and its capabilities. Premium members or rather paying members get access to the fastest download speeds, a file shredder, a zip previewer and a trace cleaner. But wait, try out the free edition first and then decide if you need the premium features. In our opinion the freebies are worth a lot more while the premium features are more of an add-on over the core benefits offered by Download Accelerator Plus.